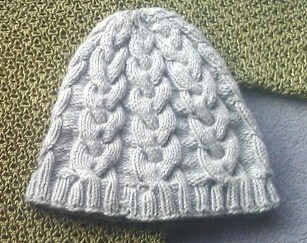 I made a cabled beanie for my brother and want to show you, how to do that cable pattern. The size is for an adult man. If you want to decrease size, the easiest way is to leave out a braid or two and start the decrease earlier. Cast on 128 stiches on a 4,5mm needle and knit the row back in knit 2, purl 2. Knit row 2 and at the end of it close knitting to a circle. All together knit 10 Rows of knit 2, purl 2. Switch to the 5mm needle and start with 4 purled stiches continued by 12 knitted stiches, repeat this 7 more times. Do this for 2 Rows. Row 37: Purl 4, Knit 4, Place 4 stiches on an extra needle in front of the knitting, Knit 2 then knit stiches 3 and 4 together, then Knit the 4 stiches from the extra needle in front, Repeat 7 more times. Row 47: Purl 4, Knit 8 then knit stiches 9 and 10 together: Now your braid where each cabled used to be made of 4 stiches, is now only 3 stiches per cable. In this way decrease now by one stiches each braid every second rows: Rows: 51, 53, 55, 57, 59. In this way decrease now by one stiches each braid every row: Rows 72 and 73. Now you should have 32 stiches left: 8x 1 purled and 3 knitted stiches. Row 76: Knit 2 stiches together and bind of, Repeat 5 more times. Looks difficult when written (and I hope you can understand my English. I guess this would definitively be a thing where I could describe things far better in German) but actually once you get the hang of it, it is quite easy. Have fun! This entry was posted in Knitting & Crocheting and tagged Knitting, Pattern, Tutorial by kathatravelling. Bookmark the permalink.